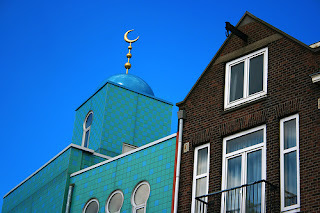 Muslims around Europe are launching committees of "Ex-Muslims"
Possibly the most interesting part of the debate in the Netherlands has been about freedom of speech and whether it includes the right to insult. Obviously, freedom of speech has its limits (especially as regards hate speech), but it does include that basic right. However, people who insult also offend, and (as Christopher Hitchens says) Muslims have proven themselves champions at avenging insults with violence. At least in recent years. But who in the world DOESN'T get bothered by insults? That's the point of an insult, after all. Last month, Dutch police sued and WON a suit against a guy who gave them the finger, saying it was illegal to insult an officer because it was damaging to his authority and reputation. That was an extremely bad ruling, and wouldn't stand up in U.S. courts. On the other hand, who is so stupid that he gives the finger to a police officer? Anywhere in the world, from Saudi Arabia to the United States to France to Japan, you are asking for trouble when you make an obscene gesture at a cop. You may not have done anything (else) wrong, but you are sure to be punished in some way; in my experience the kind of people who become police officers are often the same kind of people likely to enjoy wielding authority and bullying. 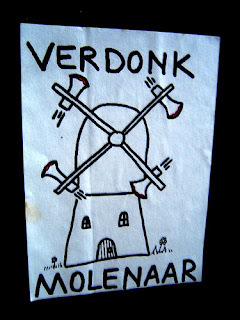 The previous Dutch immigration minister, Rita Verdonk, sued to prevent squatters from hanging a banner that read "Rita Mordenaar" _ which means, "Rita Murderer." Under her regime, a dozen immigrants were burnt to death while awaiting deportation in a hastily built prison. Is that insult not fair comment, especially for a public figure? The squatters initially lost their case, and were forced to hang banners that read "Rita Molenaar" instead. That means, "Rita Windmiller" But it sounds almost exactly like "Murderer" in Dutch. Only hilarious. Is this really a society where all criticism of public figures has to take place through satire or allegory? So back to the Muslims. The founder of the Dutch ex-Muslam group, Ehsan Jami, says he's not anti-Islam, but he also says insulting things about the prophet Mohammed _ it's his right. And of course it's also his right not to be attacked on the street. However, wouldn't he be more likely to win sympathy for his cause among Muslims if he just stuck to the point? A rival group of Dutch Ex-Muslims (!!) has formed to protest for a less confrontational approach. They announced their formation in an Amsterdam mosque (!!!). Jami argues there's no need to let Muslims play 'victim' and they should be able to take a few barbs. Nobody was murdered over "Piss Christ" in the U.S. But again, why intentionally say things that you know are going to offend, when it's not even your primary goal? I hope Jami lives to be older and wiser. Or that I do.